Critical Reviews in Oncology/Hematology publishes scholarly, critical reviews in all fields of oncology and hematology written by experts from around the world. All review articles, invited or submitted spontaneously, are subject to peer review before final acceptance. 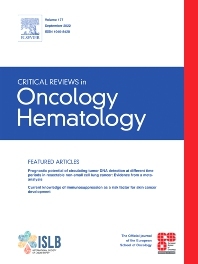 Critical Reviews in Oncology/Hematology is the Official Journal of the European School of Oncology (ESO). The Editors of Critical Reviews in )Oncology/Hematology will usually not consider pre-submission inquiries. Kindly refer to the Critical Reviews in Oncology/Hematology's Aims and Scope to ensure that your paper fits the journal's scope. Further information regarding the submission of manuscripts and guidelines for the preparation of the manuscripts can be found in the Guide for Authors.